I have become heir to what once was a beautiful, professionally designed garden. Because it was neglected for a number of years, it has turned into a jungle, taken over by Queen Anne’s lace, trumpet vine, wild morning glories and other noxious weeds. Here and there and now and then, I’ve pulled up some of the worst, the ugliest or the most in our way. The inside of our new house was to be cleaned and boxes unpacked and repairs made. We had guests for almost two weeks. The garden has had to wait. Our first days here, my husband hired a man with a weed whacker. “Cut it down,” he told him, “but try to leave some of the flowers.” He left all the Queen Anne’s lace and it produced stickers for the cat’s coat and our shoe strings. I’ve been giving the garden my all for the past week or so. Early mornings just after dawn but before the sun, I douse myself with natural bug repellent and then spray my clothes with DEET before doing battle with the pesky plants. “Spray it with herbicide!” my husband advises when I complain about all the chigger bites and scratches and sweat. Among the weeds, I’ve found a few surprises. Pulling catbrier and bindweed and other vines, I discovered passion flower blooming. Under the grape vines, I exposed a large fragrant patch of mint. 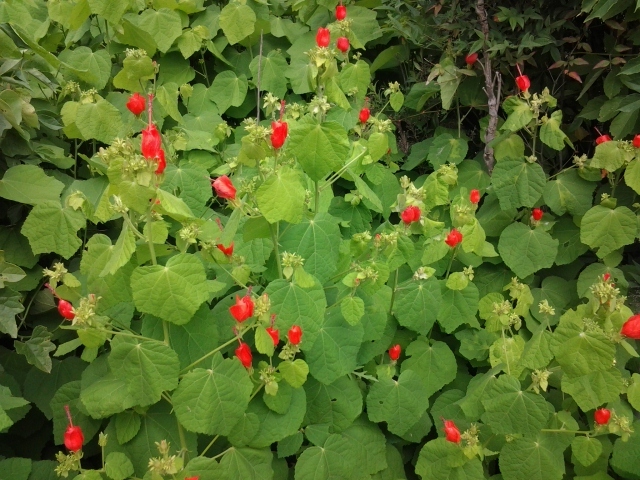 Not being a native Texan, I don’t know every weed that thrives in the South. Not ever having had a wetland or even dense shade, there are things planted out there I’ve never encountered, like swamp Jessamine and horsetail grass and miniature palms. There were clumps of something getting terribly tall. It looked like a weed and grew like a weed but it was alien to me. “Let’s wait and see,” I persuaded. I am loath to pull up or cut down anything I’ve not identified. 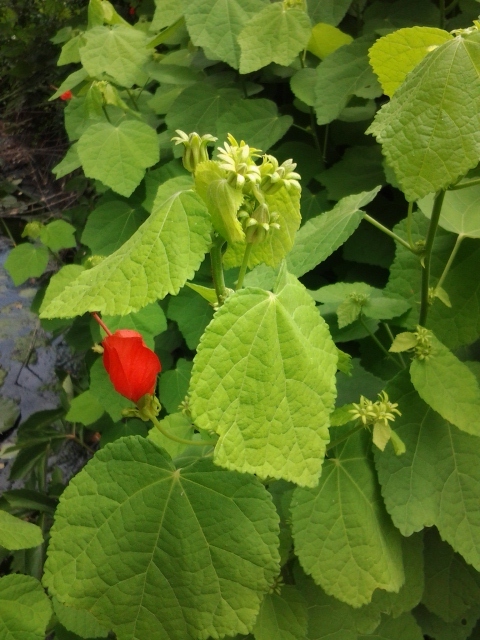 We were rewarded with blooms: bright paper lanterns of Chinese red accompanied by insignificant green flowers. I still don’t know what it is but it’s pretty and worth the wait. My husband continues to look at me with incredulity when I get between him and the weed whacking. “Wait!” I insist, “Just a few days,” I plead. I remind him of how the fan in our new convection range rattled after the repairman fixed an unrelated part. He told me to leave it alone for a few days and maybe it would stop making that noise. It did! And that’s almost as incredible as finding red lanterns in a weed patch. This entry was posted in Short Takes on Life and tagged Chinese lanterns, good things come to those who wait, impetuosity or patience, passion flower, trumpet vine, wait and see, weed whacking, weeds in the garden, wild grape vine. Bookmark the permalink. So glad your unexpected discoveries are identifiable. I thought of some kind of lantern, but no photos to compare. These garden books and gardeners fall short sometimes. sorry for the pun. But I don’t know what it is! LOL. I think it is related to Physalis alkekengi but everything says they only grow to one foot and pics show many pods on each stem. These have ONE pod per stem and at least 3′ tall. I don’t think there is any fruit in the pods either. Short puns always tolerated! Thanks for commenting.